Complete body machine for pedalling, running & cycling. You can see list of our Cardio World Orbitrack 2050 vs Sole E25 below, perform Side-by-Side comparison. If you need further help, do have a look at Conzumr Guides and Tips. Alternatively you can view all Cross Trainer/Elliptical to choose your own favourites. 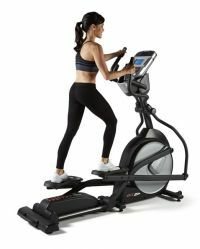 The SOLE E25 elliptical combines both a great exercise as well as a natural human movement. For the E25 we took the best features of our residential models and added a few additional upgrades of our own. Custom Designed Foot Pedals - These unique foot pedals were developed in collaboration with a leading physical therapist. Together with SOLE engineers we designed a 2 degree inward slope to the foot pedals which reduce ankle and knee stress common in other Light Commercial elliptical machines. Articulating Foot Pedals - Not everyone walks the same; for this reason we have made the pedals articulating to fit the way you walk. This feature also reduces the numb toe effects and sore Achilles tendons helping users to focus less on being uncomfortable and more focused on achieving goals. Power Incline - This feature separates SOLE from the rest of the market. It creates a completely different workout that targets areas of the lower body that normally would not be worked out on an elliptical without Power Incline. Strong Frame - The SOLE E25 uses heavy 38 mm steel that’s designed to support user weight capacity of up to 350 lbs. Easy to use electronic console with a vibrant blue back lit LCD display. Includes a built-in cooling fan and water bottle holder. The console also has built in speakers which allow you to hook up any MP3 player(iPod, etc.) for easy listening. Fluid natural motion provided by a whisper quiet drive system. Functions in both forward and reverse motion. The combination of a heavy 25 lb. flywheel and a high gear ratio not found on comparable models means an extremely smooth feel with plenty of resistance at the top end for a machine that will provide a challenging workout. The E25 also has a power incline feature which offers additional resistance as well as variable positions for diversity in your workout. You simply press a button to raise the incline ramp to your desired position. The ramp angle is fully adjustable from a level plane, up to 30 degrees, allowing you to individually target and work all major lower body muscle groups. Upper body exercise provides a total body workout. Stationary handle bars with built-in pulse sensors for monitoring your heart rate. A heart rate chest strap is also an optional ad on for highly accurate wireless monitoring. Oversize foot pedals for a comfortable workout. These unique foot pedals were designed in collaboration with a leading physical therapist and sports enthusiast. Sole engineers have designed in a 2 degree inward slope to the foot pedals which reduce ankle and knee stress that is common in other elliptical machines. The footbeds also articulate for optimal user comfort and performance. The two real wheels which ride on heavy duty rails provide a smoother more stable feel and reduce side to side foot pedal motion. A feature found only on more expensive models. 1473 " Sole E25 : 1473 "
1803 " Sole E25 : 1803 "
685 " Sole E25 : 685 "
To Recieve updates and possible rewards for Sole Sole E25 please sign in. To Recieve updates and possible rewards for Cross Trainer/Elliptical please sign in.